The most recent edition of the SPS Alumni magazine, the Alumni Horae, includes an in-depth article on the history of Form plaques at SPS. Expertly written by Jana Brown, it includes information on how the tradition of the plaques began, a look at the first carver, J. Gregory Wiggins, and details of how the tradition is being carried on today. 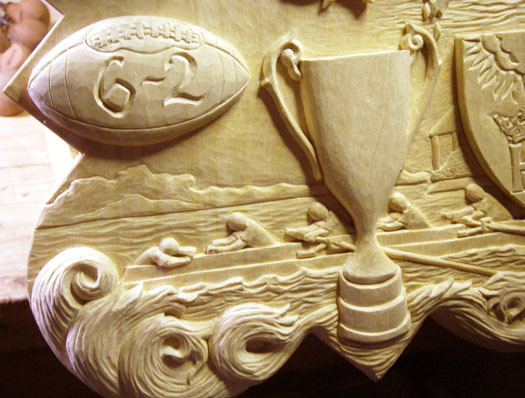 This detail shows the waves and water surrounding the crew team – representing the trip to Henley. 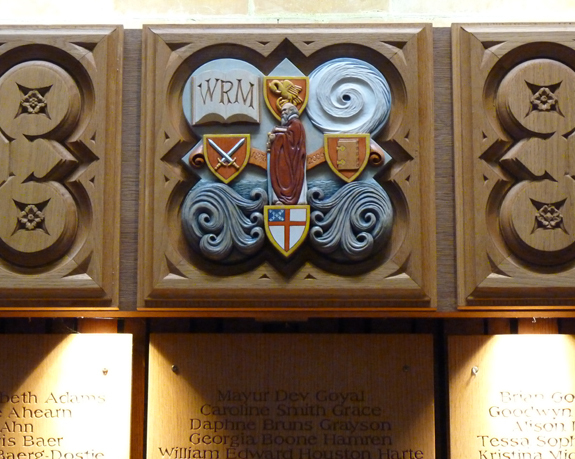 This detail shows the closed book with Mr. Matthews’ initials representing the end of his term as Rector, and a portion of the Delphian emblem representing their Club Cup victory. 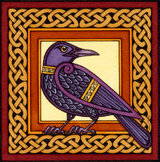 I will now begin work on carving plaques for the Forms missing plaques from the last twenty years. 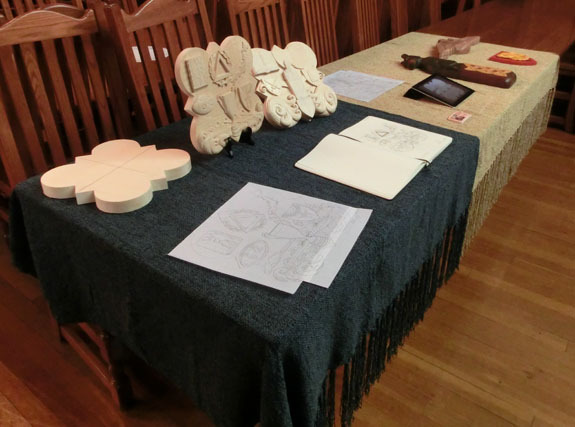 In the works are designs and plaques for the Forms of 1996, 2001 and 2006. Progress on those plaques will be documented here as with the 2011 plaque, so check back often to see how things are progressing. 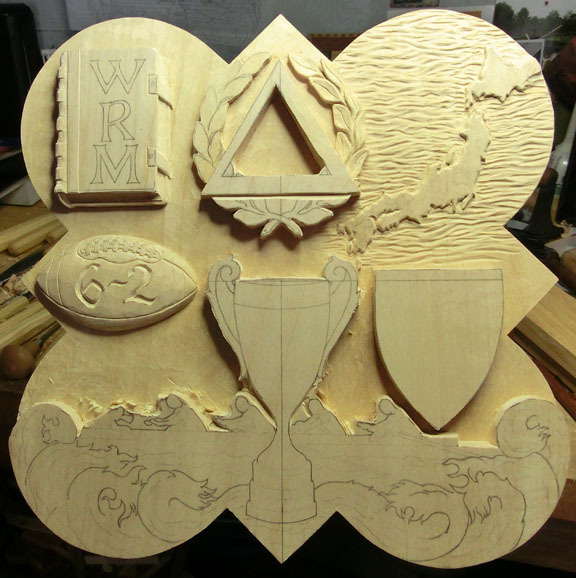 The following photos show the progress so far on the Form of 2011 plaque. 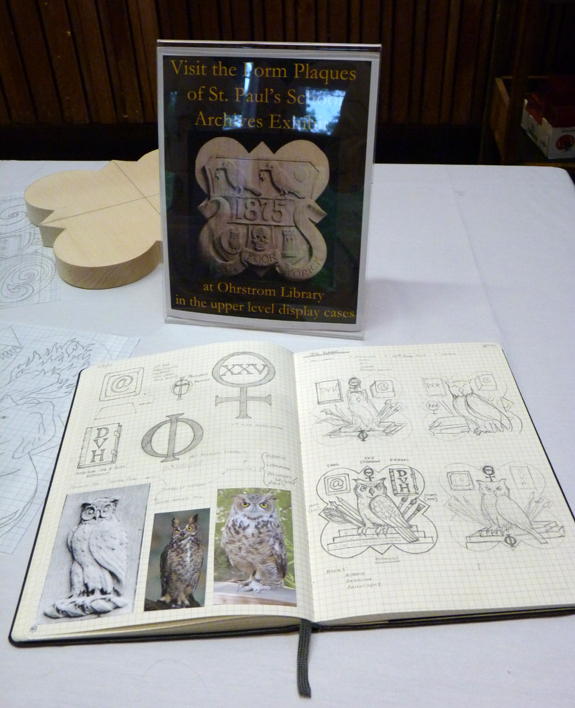 The photo above shows the design outline transferred onto the plaque blank. Just the major design elements are transferred at this point. The photo above shows the plaque after the background has been removed using a small format router. 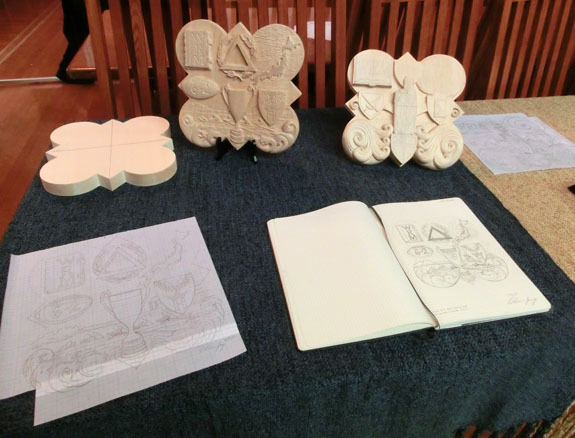 This very rough stage is smoothed over using carving tools, and the outlines are then cleaned up and refined. 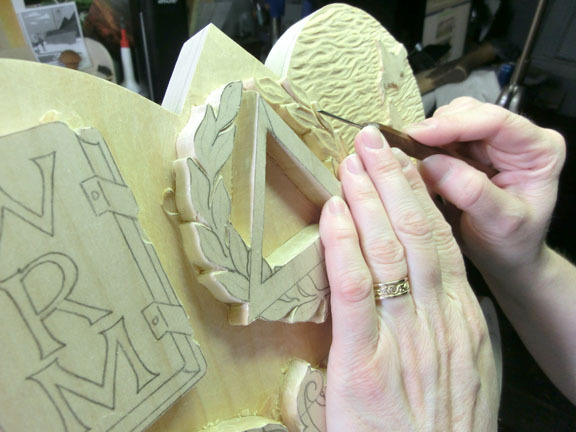 Here is a photo of me adding some of the initial detail to the plaque design – the laurel wreath around the Delphian Delta is starting to take shape. In this photo you can see the finished football center left, and the map of Japan top right. The book with Mr. Matthews’ initials is almost complete at this stage. 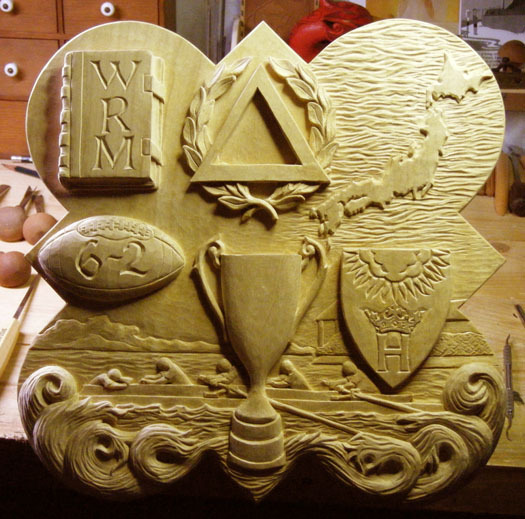 More details need to be added and the lower section needs to take shape, so there is still quite a bit to be done before this carving is complete. I will update with more photos soon. 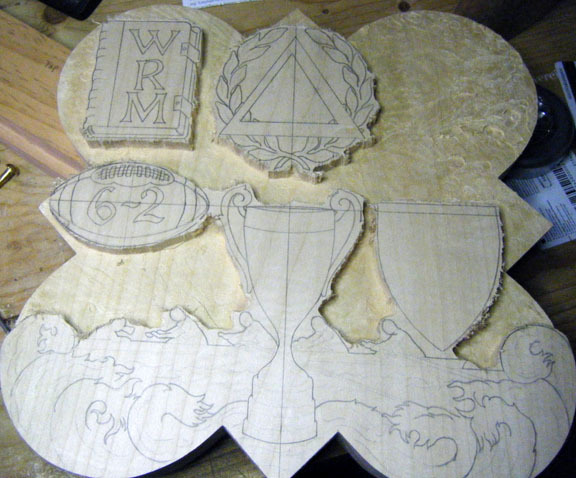 The rough draft of the design for the 2011 Form plaque is completed and work has begun preparing the wood for carving. 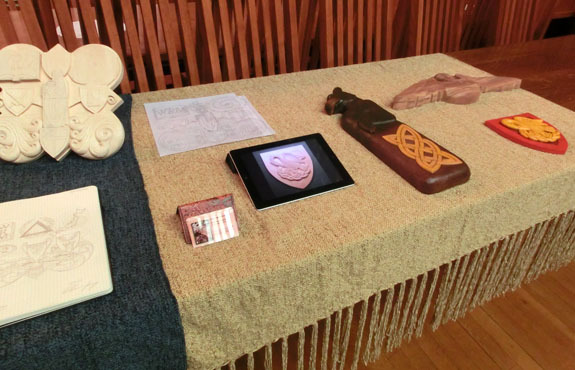 The picture above shows the piece of basswood that will be used for carving the 2011 plaque. 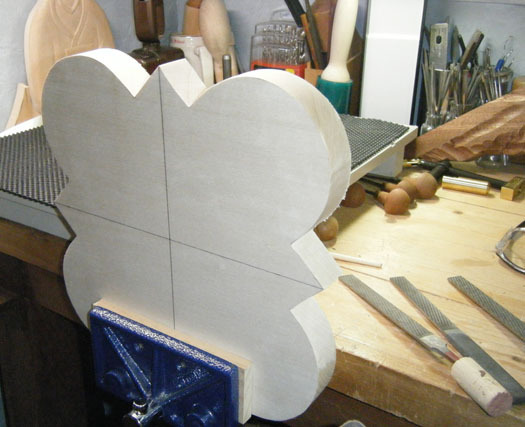 I cut out the distinctive quatrefoil shape using a scroll saw and am using three grades of Japanese files to smooth the edges and finish the carving blank. 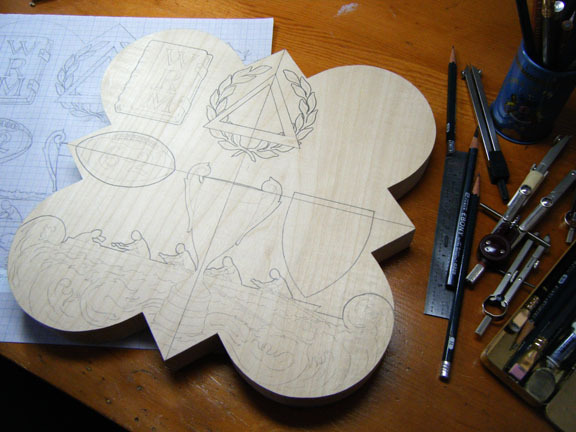 Once this stage is complete I will transfer the design onto the wood and begin the actual carving process. Central Motif: The Club Cup was the big event of the school year. It will be represented in the center of the plaque with the symbol above it of the winner of this year’s club competition (congratulations Delphians!). 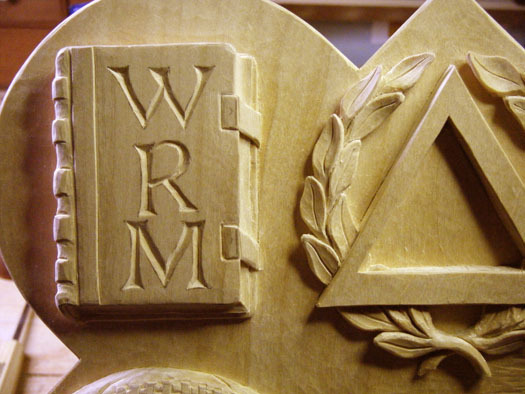 Upper Left: A closed book will be shown with the initials WRM representing the end of Mr. Matthews’ Rectorship. 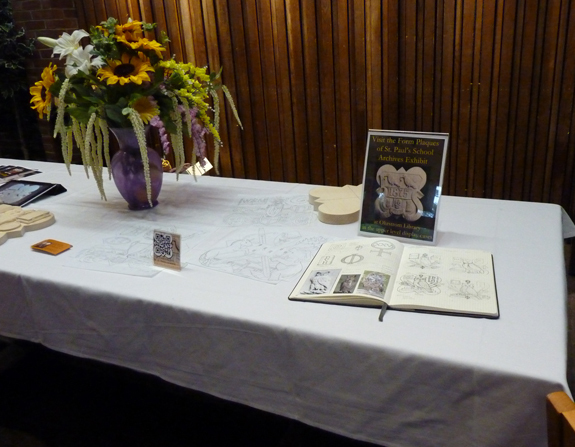 The book symbolizes the Rural Record, a journal of day-to-day life at SPS that was kept from the very beginning of the School up into the early 20th century. The book with initials is symbolic of the recoding the change of leadership in School history . You can read more about the Rural Record by clicking HERE. Upper Right: A map of Japan with circles radiating out from the epicenter will be shown to represent the devastating earthquake and tsunami that occurred there earlier this year. Lower Right and Left: This section of the design will represent the crew team competing at the Henley Royal Regatta this June. A shield super-imposed above and to the left of the crew team will feature an element from the coat-of-arms from the Henley-on-Thames Town Hall. Very special thanks to Ellie, Joe, Sam, Harvey and Meredith for their help with the design themes!